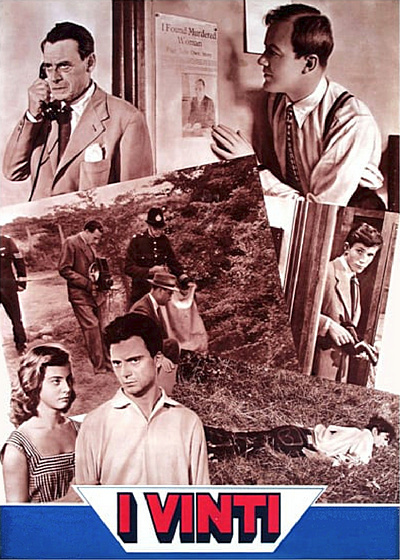 Michelangelo Antonioni's daring second feature, originally released in England as Youth and Perversion, was made as a commentary on the postwar generation. There was, and still is, the idea that children growing up in Europe during the WW2 had known nothing but violence throughout their lives, and thus became desensitized. The film began as a project designed to highlight the problem of juvenile delinquency in Europe. I Vinti unfolds in three episodes, set in three different countries. In the first episode, set in France, a group of young people plans an outing in the country, where some of them plan to murder a rich friend and steal his money. The second episode takes place in Italy, where a young man smuggles cigarettes for a living and becomes involved in a murder. And in the third, set in London, a cynical, snooty young poet reports a dead body to the police, hoping to profit from it. The finished product, compromised upon release by conservative producers and distributors who would force the director to re-edit a significant portion of the film, isn’t in any form one of Antonioni’s benchmark accomplishments. What it is, however, is a fascinating snapshot of a young filmmaker figuring out his political and aesthetic ideologies on screen, and an early example of contemporary omnibus storytelling which has since proven both profitable and popular.